Now, facing my senior year, I know I have found the answers to all those questions and more. Emory is a place where I can express my spirituality while finding and growing into my path in life. The unique blend of academics, diversity, and spirituality strengthens and supports the process of discovery. Emory cares for, develops, and encourages the growth of mind, body, and soul. One of those groups is the campus ministry of the United Methodist Church. 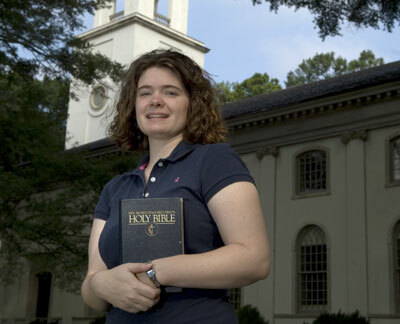 The Wesley Fellowship community is the heart of my experience at Emory. The community welcomed me as a freshman, nurtured me as a sophomore, and strengthened me as a junior. They are the ones who support me during the ups and downs of my faith and life journey. My campus ministers were and still are some of my life’s greatest mentors. Wesley Fellowship involves its members not only in the Emory and Atlanta community, but also missions in other areas of the United States and the world. The support that Wesley gives me teaches me I can give support back to the community around me. We laugh, cry, sing, dance, and goof off together. Through it all, I know the community is always there for me. Continually, the community strengthens and deepens my faith. Through Wesley Fellowship, I discovered University Worship. The different people who come from Emory and across the world open my eyes to diverse experiences and spiritual growth. I enjoy it so much that I became a University Worship deacon. My first semester as a deacon, I was surrounded by seniors. I learned so much from my fellow deacons about all topics, spiritual or otherwise. They guided my spiritual path, while introducing me to ideas or worship structures I did not want to appreciate. Over time, they knew I would come to love all expressions of worship. Through Wesley Fellowship and University Worship, I participated in two Spring Break United Methodist Seminars. The program is a two-day seminar in which students meet with interfaith workers and leaders from different faith communities. Each year I’ve learned more than I thought possible. During this last trip in March, I achieved more understanding than the year before. This March, I was fascinated by a man who leads an Islamic school in the Bronx. He exemplified what interfaith work should be—working together with neighboring communities. You need not accept every aspect of another’s religion, but you should at least learn and understand where your neighbor is coming from so you can work together. After listening to a panel discussion, a good friend and I had lunch with the Hindu and Sikh panelists. Just listening to them and engaging with them in conversation is something a South Dakota girl doesn’t often experience. Through Wesley Fellowship, University Worship Deacons, and the Inter-Religious Council, I have learned that the interfaith dialogue is important and helps us understand others around the world. Others and I have opportunities to work and be leaders in social justice programs. This lesson of interfaith work and dialogue is one of the important lessons I will carry with me after leaving Emory. The ability to communicate and work across numerous lines to fight the biases of our world will guide my thoughts, actions, and deeds throughout life.